One of the first things to do when you start to use Adobe InDesign is to set the units and increments you want to use in the documents you create. This is done through the Preferences > Units & Increments dialog box. How do you access the Units & Increments dialog box? What the the Ruler Units? What are other items that can be adjusted? When you are working on document, you can view rulers across the top and down the side of your InDesign work space. They can help in aligning objects. You can set the configuration or origin of the rulers, as well as their increments, from the dialog box. The origin or starting point of the ruler can be set to Spread, Page, or Spine. By selecting Spread, the ruler will start from the left hand side of the document and span across the spread of the document. By selecting Page, the ruler will start at the left hand side and stop when it gets to the end of the page and it will start at zero again. The Spine preset is useful when you are using facing pages. The ruler will start its zero point from the spine and work outwards to the edge of each document. When working on a book, I set the Origin as Spine. I prefer to see page sizes in decimal increments of inches. It seems like the default setting for these items are sufficient. 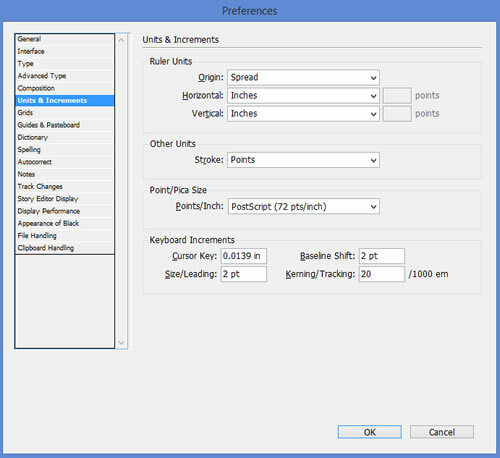 It is good to set your preferences of units and increments when you start to use Adobe InDesign. You can access the dialog box for setting the preferences from Edit > Preferences > Units & Increments. In designing a box with facing pages, I normally set the Origin as Spine. I also set the units as Decimal Inches. The other setting can be left as is.